A subdivision in Kane County, Illinois encroaches on a farmhouse as the county grapples with expanding residential needs and the desire to maintain its agricultural roots. Driving along Route 47 in Kane County, Illinois, corn and soybean fields are dotted with signs advertising the amenities of burgeoning communities. The billboards boast quality schools, tennis courts and swimming pools. Juvenile trees offer little shade on winding lanes and cul-de-sacs. In these new developments, streets end abruptly into soybeans and fire hydrants sit conspicuously close to shin-high corn. 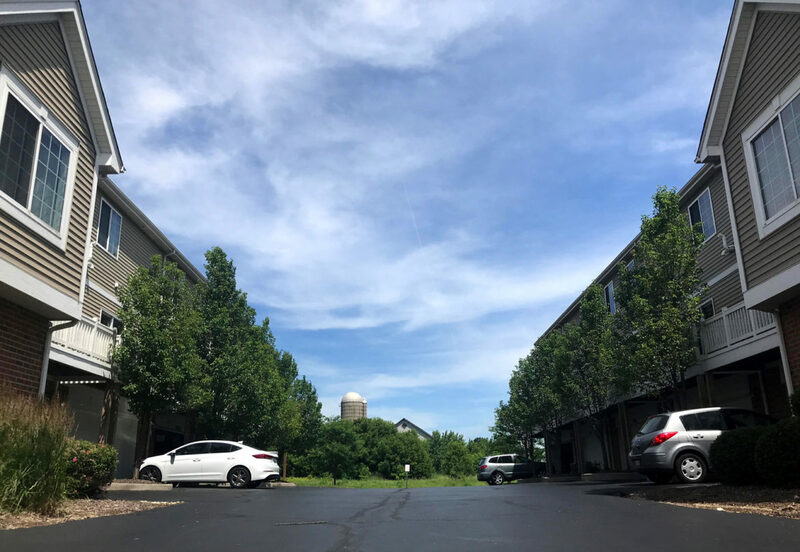 For more than 20 years, Kane County has been a poster child for urban sprawl, the spreading of development of land on the edge of a metropolitan area. As Chicago’s suburbs marched outward in the 1990s and early 2000s, county planners saw developers buying up farmland, sitting on it until the demand for new homes reached a critical mass and then building sprawling homes with oversized lawns and three-car garages. “Suburban sprawl was chewing up land at a very fast pace,” said Janice Hill, Farmland Protection Manager for Kane County. Urban sprawl began in the 1950s and has been a concern of city planners and the agricultural community since the early 1990s. But a new study from American Farmland Trust shows development around small towns across the Midwest has contributed nearly as much to the loss of agricultural land since 1992 as urban sprawl. American Farm Trust is a nonprofit advocacy group with a mission of protecting farmland, promoting sound farming practices and keeping farmers on the land. According to its latest report, “Farms Under Threat,” nearly 31 million acres of farmland were lost to development between 1992 and 2012. That’s more than double the acres registered in the group’s previous report, last published more than a decade ago. American Farmland Trust said the two factors contributing the additional 15 million acres are “low-density residential development” and woodlands adjacent to farmland, neither of which were previously considered. Earlier studies focused on land consumed by the rapid expansion of big cities. Using data from U.S. Department of Agriculture and the U.S. Geological Survey, American Farmland Trust partnered with Conservation Science Partners, a non-profit scientific organization, to identify land loss in rural areas and wooded farmland not previously considered. Ann Sorenson, director of research for American Farmland Trust and author of the report, said there’s no universal definition for “low-density residential development,” but it can be seen both in suburban sprawl and rural communities. She points to her own community of Oregon, Illinois, a town of less than 4,000, as an example of the creeping development in rural settings. Sorenson said this “scattered loss” of farmland around smaller communities may not seem like much, but in addition to the farmland lost to development, cities have to run utilities, sewer lines, roads and other public services to the sites. Those incidental bits of land add up. Map: Acres gained and lost. The green counties have gained farm acres since 1997, while the red counties have lost acres. Sorenson said the loss of agricultural land looks different across the country. In the west, the Farmland Information Center said expansive ranches are being divided into smaller parcels and sold as 40-acre residential properties. While 40 acres might not seem small, grazing land often spans hundreds of acres. Taking that much acreage out of a ranch adds up. On the east coast, efforts to create more sustainable, local food production mean a troubling outlook for an already crowded landscape. Farmland competes with forests as well as housing in states like Maryland and New Jersey. Sorenson said one study proposes deforestation to make room for farmland. The loss of 31 million acres of farmland is significant: that’s 3.4 percent of the 911 million acres that were in agricultural operation in 2o12, according to the USDA’s National Agricultural Statistics Service. But according to Paul Gottlieb, associate professor of agricultural, food and resource economics at Rutgers University, running out of farmland is a distant prospect. “Doomsday is very far off,” Gottlieb said. He admits that projecting farmland loss is a challenging exercise, because it is hard to accurately factor in market forces. But Gottlieb said it is worth calculating a straight-line forecast, as it can offer a look at how at-risk farmland is, especially in regions where resources are tight. In his 2015 study, “Is America Running Out of Farmland?,” he estimated that all prime agricultural land would be eaten up by development by 2572. And, he said, applying this “doomsday” calculation to each state offers differing levels of urgency. Arizona could deplete its scarce prime farmland in the next 33 years, while much of the Midwest’s agricultural soil is safe from development until at least the year 4000. As technologies such as precision farming, genetically modified seeds and better resistance to pests advance, farmers continue to harvest greater yields, meaning America may be able to produce more food, fiber and fuel on fewer acres. Gottlieb said there are more immediate risks to America’s farmland than development — erosion, pollution and climate change chief among them. Sorenson said they also looked at what the loss of farmland would mean for the environment. American Farmland Trust found that, of the 31 million acres of farmland lost in the last 25 years, 11 million acres were prime farmland. The removal of prime farmland means farmers have to work harder to get the same yields - often at the cost of the environment or the consumer. Sorenson said American Farmland Trust plans to analyze the effects of soil erosion, water availability and other climate-related threats to agriculture in future reports. Sorenson said development of prime farmland will only accentuate the need for better stewardship of the land. This story is the first in a two-part series about farmland loss. To read about what communities are doing to preserve farmland, read Disappearing farmland: Despite value, little protection exists for Midwest farmland.